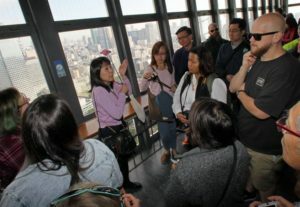 As Japanese hotels and tourist sites adapt to unprecedented numbers of foreign visitors, the tightly regulated profession of tour guide is following the flag and preparing to reform. At the end of March, the government doubled its target for foreign tourists, aiming to lure 40 million visitors a year by 2020. It pledged a range of reforms, including “radically overhauling” the regulations governing the tourism sector. Then in April, the Japan Tourism Agency decided to deregulate the tour guide industry, saying there could be a massive shortage of licensed guides in the face of growing demand. Enacted in 1949, the tour guide law allows only holders of a national license to earn money while escorting foreigners around the sights. Violators face potential fines of up to ¥500,000, although there are some government-designated sites where the restriction does not apply. 1. Have you ever gone on a tour without a tour guide? How is it different from a guided one? 2. What do you think are the qualities of a good tour guide? Why is it necessary for them to have a license? 3. Early this year,a Chinese woman, with a dependent visa, was deported from Japan for illegally working as a tour guide for foreign tourists in Kyushu. It is believed that she earned around 30M yen in just a matter of 7 months. On the other hand, license holders are shying away from the job because of very low income (ave of 1M yen in 2013), Please share your opinion on this matter. 4. Aside from popular tourist destinations in Kyoto and Tokyo, can you recommend less known places that you think can become crowd pleasers as well?